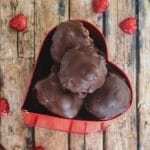 Italian Chocolate kisses, a fast and easy no bake recipe. 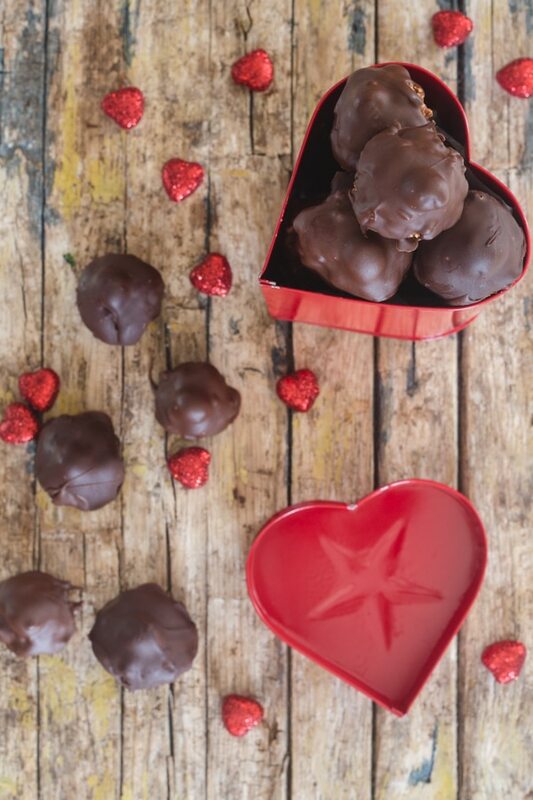 Only four ingredients needed to make one of the most popular Italian chocolates. I live in a divided house, there are the Baci Chocolate lovers and the Ferrero Roche Chocolate lovers, I on the other hand will take either. My eldest daughter loves Baci Chocolates so much I made her a decadent over the top Baci Chocolate Cake for her birthday. The Italian and his youngest daughter can go through a box of Ferrero Roche faster than anyone I have ever seen! To temper chocolate all you need is a bowl, a pan and a thermometer. You can use either a double boiler or place a bowl over a pot of simmering water (make sure the bowl does not touch the water). Use a good quality chocolate (be sure to chop it into pieces) keep aside a quarter of the chocolate in a separate bowl to add later. Bring the water in your saucepan to a simmer. Using a silicone spatula continuously stir the chocolate until it is melted and smooth. Remove the bowl of chocolate from the saucepan and carefully wipe the steam from bottom of the bowl. Do not let even one drop of water fall into the chocolate because it will cause the chocolate to seize and then your chocolate is completely ruined! So please be careful! Then add the remaining chocolate to the melted chocolate, this will help bring down the temperature of the chocolate. Now you are ready to dip your chocolates! The Baci was born in Perugia in 1922, in a small chocolate company with only 15 employees, the chocolate was invented by the manager Luisa, this famous chocolate was actually originally named “Luisa” after her. She originally wanted to call the chocolate “Cazzotto / Punch” because it reminded her of the knuckles of a clenched fist, how romantic is that? Thank goodness the naming of the chocolate was not up to Luisa. In 1924 the Bacio Chocolate was born, with it’s blue and silver packaging and romantic note hidden inside. It became the best selling Valentine’s Day Chocolate in Italy. 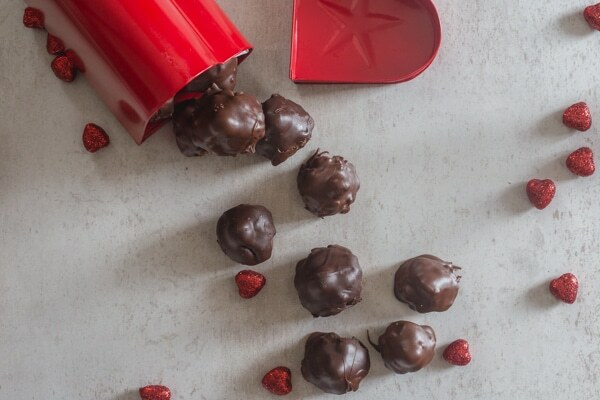 So if you feel like making some decadent Italian Chocolate you can start with these Italian Chocolate Kisses – Baci. Enjoy! 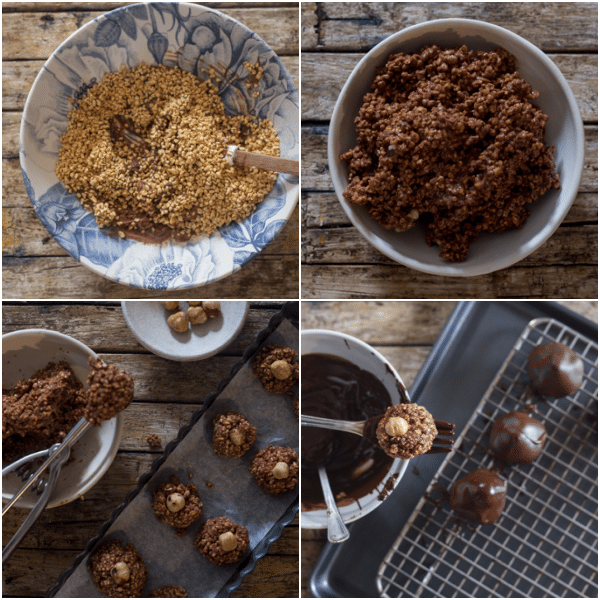 Roast the whole hazelnuts on a cookie sheet for approximately 5-8 minutes in a preheated 350F (180C) oven, remove them from the cookie sheet and place in a bowl to cool. Do not let them cool on the cookie sheet or they will bake even more (not a good idea, they could burn). In a medium bowl over a medium pot of water (bain-marie) add the milk chocolate and butter, melt together and mix until smooth. Let cool, then mix in the Nutella and ground nuts. Cover the bowl with plastic and refrigerate for approximately 15 minutes. 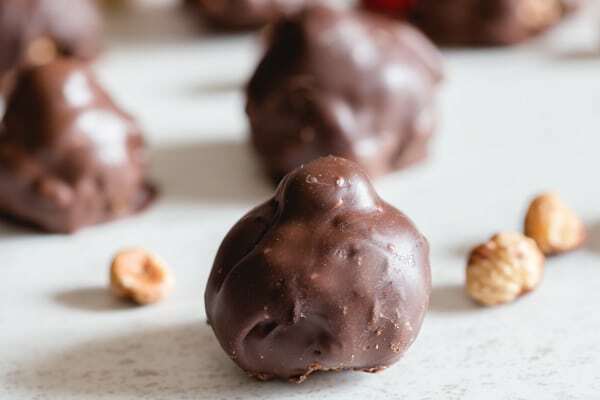 Remove the mixture from the fridge and form into 14 balls, place them on a parchment paper lined cookie sheet or freezer safe plate, slightly flatten the top of each chocolate ball and place one whole hazelnut on each. Place the chocolates in the freezer for 30 minutes. While the chocolates are in the freezer start to make the dipping chocolate, place 3/4 of the chocolate in a bowl on top of a small pot of water (make sure the water does not touch the bottom of the bowl, bring the water in the pot to a simmer. Using a spatula continuously stir the chocolate until it is melted and smooth. Then place a thermometer in the chocolate and bring it to –118F (48C) for Dark Chocolate or 112F (45C) for Milk Chocolate. Remove the bowl of chocolate from the pot and carefully wipe the steam from bottom of the bowl. Do not let even one drop of water fall into the chocolate because it will cause the chocolate to seize and then your chocolate is completely ruined! So please be careful! Add the remaining chocolate to the melted chocolate, this will help bring down the temperature of the chocolate. Keep stirring until the temperature of the chocolate reaches –89-90F (32C) for Dark Chocolate 86-88F (30C) for Milk Chocolate. 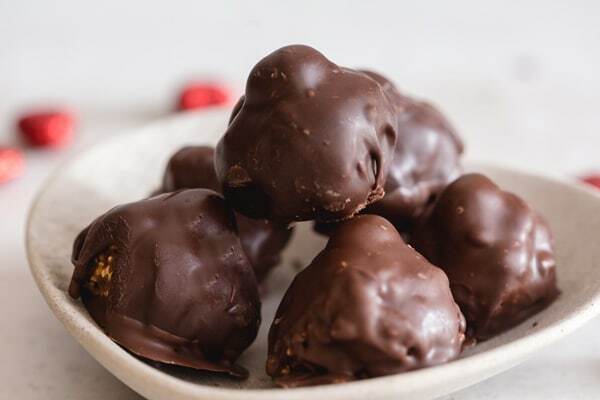 Remove the chocolates from the freezer and dip in the cooled chocolate, place the dipped chocolates back on the plate, let the chocolate harden, can be placed in the fridge to harden, serve. Enjoy! Ferrerro Rocher is literally my fav! I can’t wait to make these! Yes, myself and hubby and he doesn’t do hazelnut so YES, all for me, and maybe a cpl for company to show your recipe off! Hi Christina, thanks, lucky you all for you (maybe). Have a great rest of the day. I love those Ferrero rocher chocolates, but Baci are my favorite. You recreated them so well, and just in time for Valentine’s Day. I know those treats will be out of this world good. I don’t ususally eat sweets – not because I don’t like them, because Hubby would eat them before I could get to them. I’ve got to try this recipe and set a few of them aside for me. Hi Amanda, well it’s what most chocolate bars are made of and it contains powder milk. https://science.howstuffworks.com/innovation/edible-innovations/how-chocolate-is-made7.htm hope this helps.